WASHINGTON (CNN) -- Senate Democratic leaders met Thursday night with White House officials to consider including a government-funded public health insurance option, along with a provision allowing states to opt out of it, in a health care overhaul bill. 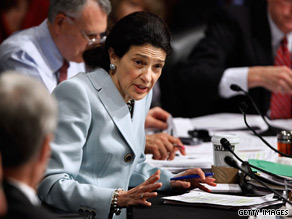 Sen. Olympia Snowe has been the only GOP supporter of health care legislation. According to one source familiar with the White House meeting, the matter was discussed with President Obama but no decisions were made. Obama and Democratic leaders say the nonprofit public option will bring competition to the health insurance industry and lower costs while expanding access to Americans currently without coverage. Republican opponents contend a public option would drive private insurers from the market and lead to an eventual government takeover of the health care system. Of five health care bills approved so far by House and Senate committees, four include a public option. The other bill, from the Senate Finance Committee, includes nonprofit cooperatives instead of a public option and is the proposal supported by Snowe. In recent days, two administration officials have told CNN that the prevailing White House opinion is for the Senate health care bill to include a so-called "trigger" mechanism proposed by Snowe that would bring a public option in the future if thresholds for expanding coverage and lowering costs go unmet in coming years. The source familiar with Thursday evening's meeting said Obama "pushed for a so-called trigger, because it's the more bipartisan way to go," due to Snowe's support for the concept. A critical White House goal in passing a health care bill is the ability to call it bipartisan, so Obama officials are wary of doing anything to alienate Snowe. Also Thursday, 36 moderate House Democrats threatened to vote against the current health care bill the chamber's leaders are drafting because they don't believe it will sufficiently reduce long-term health care costs. In a letter to House Speaker Nancy Pelosi, D-California, and House Majority Leader Steny Hoyer, D-Maryland, the fiscally conservative Democrats cited recent testimony by Congressional Budget Office Director Doug Elmendorf that indicated health care costs under the House legislation could rise after 10 years. Elmendorf "has already indicated that the bill does nothing to rein in the costs of health care, and therefore may not be sustainable outside the 10-year budget window," the letter said. "We will be unable to support any health care legislation that doesn't meet the president's goals of driving down and holding down the cost of health care, as determined by" the CBO, the letter concluded. A Democratic leadership aide told CNN that final analysis from the Congressional Budget Office will be crucial to passing a bill in the House. "If we do not get a reasonable sort of indication from CBO that we're going to bend it, that will be a problem," the aide said of lowering costs in the future. House Democratic leaders learned earlier this week that the CBO projected their bill would cost $871 billion over 10 years and also reduce the deficit during that time. But the CBO was unable to assess what the impact would be in the next 10 years. Moderate Democrats have asked leaders for details about the long-term costs from CBO, but no final analysis has yet been released. Rep. John Barrow of Georgia, a leader of the fiscally conservative "Blue Dog" Democrats, initiated the letter because "the question of cost isn't one that should be swept under the rug," said Barrow's spokesperson, Jane Brodsky. CNN's Dana Bash and Deirdre Walsh contributed to this story.